The Pentagon's 2019 budget wil include $300 million for the train-and-equip program for the Syrian Democratic Forces (SDF), predominantly led by the PKK-affiliated People's Protection Units (YPG), and $250 million for building a "border security force" in Syria, the U.S. government unveiled on Monday. According to the budget bill that President Donald Trump signed Friday, Pentagon will get $1.8 billion for train-and-equip programs in Syria and Iraq. The spending was $1.4 billion for the 2018 budget. 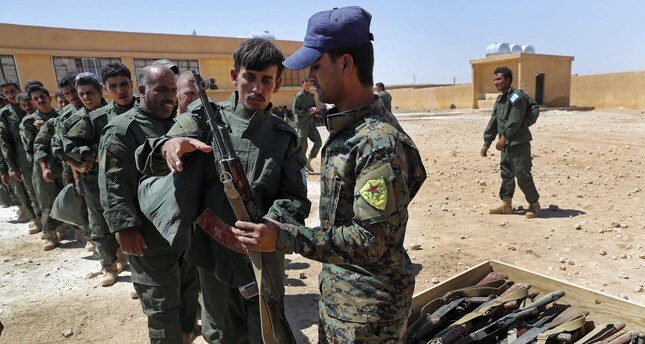 The money allocated for the SDF's training is part of the spending in border security requirement in anti-Daesh missions. The Pentagon has increased the money allocated for its partners in Syria, including SDF forces, to $500 million. It also requested $850 million for providing training and other military assistance to Peshmerga forces and the Iraqi army. The budget bill includes huge spending increases for the military: The Pentagon will get $94 billion more this budget year than the last -- a 15.5 percent jump. It's the biggest year-over-year windfall since the budget soared by 26.6 percent, from $345 billion in 2002 to $437 billion the year after, when the nation was fighting in Afghanistan, invading Iraq and expanding national defense after the 9/11 attacks. The Pentagon requested $597 billion to cover its annual budget, plus $89 billion to fund ongoing wars. Funds for the maintenance of the U.S. nuclear arsenal also increased. The 2019 budget documents specifically highlighted "reversing the erosion of the U.S. military advantage in relation to China and Russia" which was a focal point of the National Defense Strategy unveiled by Defense Secretary Jim Mattis in the National Defense Strategy released in January.